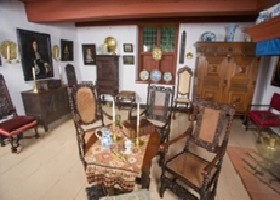 New Paltz, N.Y. – Historic Huguenot Street (HHS) has extended the special exhibition Living in Style: Selections from the George Way Collection of Dutch Fine and Decorative Art until December 16, 2018. Featuring more than 100 17th- and 18th-century Dutch items from the Netherlands—including 22 oil paintings, a rich diversity of interior furnishings, and decorative and utilitarian objects—the exhibition is installed in a period room in the historic Jean Hasbrouck House (ca. 1721) and celebrates the Dutch culture that flourished in the 1600s and 1700s in New York State’s New Netherland Colony.